The 1692 Jamaica earthquake struck Port Royal, Jamaica on 7 June. A stopped pocket watch found in the harbour in 1959 indicated that it occurred around 11:43 a.m. Known as the "storehouse and treasury of the West Indies", and as "one of the wickedest places on Earth", it was, at the time, the unofficial capital of Jamaica, one of the busiest and wealthiest ports in the West Indies, and a common home port for many of the privateers and pirates operating within the Caribbean Sea. The earthquake caused most of the city to sink below sea level. About 2,000 people died as a result of the earthquake and the following tsunami; and, about another 3,000 people died in the days following the earthquakes, due to injuries and disease. The island of Jamaica lies on the boundary between the Caribbean Plate and the Gonâve Microplate. 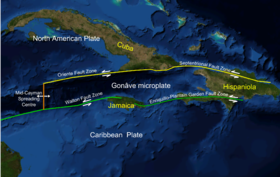 The Gonâve microplate is a 1,100 km (680 mi) long strip of mainly oceanic crust formed by the Cayman spreading ridge within a strike-slip pull-apart basin on the northern transform margin of the Caribbean Plate with the North American Plate. Jamaica was formed by uplift associated with a restraining bend along this strike-slip structure. The focal mechanisms of earthquakes around Jamaica are primarily sinistral strike-slip along WSW-ENE trending faults and minor reverse or thrust motion on NW-SE trending faults. The 1692 event is thought to have occurred on one of these strike-slip faults. Two-thirds of the town, amounting to 33 acres (13 ha), sank into the sea immediately after the main shock. According to Robert Renny in his 'An History of Jamaica' (1807): "All the wharves sunk at once, and in the space of two minutes, nine-tenths of the city were covered with water, which was raised to such a height, that it entered the uppermost rooms of the few houses which were left standing. The tops of the highest houses were visible in the water and surrounded by the masts of vessels, which had been sunk along with them." Before the earthquake the town consisted of 6,500 inhabitants living in about 2,000 buildings, many constructed of brick and with more than one storey, and all built on loose sand. During the shaking, the sand liquefied and the buildings, along with their occupants, appeared to flow into the sea. More than twenty ships moored in the harbour were capsized. One ship, the frigate Swann, was carried over the rooftops by the tsunami. During the mainshock, the sand was said to have formed waves. Fissures repeatedly opened and closed crushing many people. After the shaking stopped the sand again solidified, trapping many victims. At Liguanea (present Kingston), all the houses were destroyed and water was ejected from 40-foot-deep (12 m) wells. Almost all the houses at St. Jago (Spanish Town) were also destroyed. There were many landslides throughout the island. The largest, the Judgement Cliff landslide, displaced the land surface by up to 800 m and killed 19 people. Several rivers were temporarily dammed and a few days after the earthquakes the harbour became flooded with large numbers of trees stripped of their bark brought down after one of these dams was breached. A pocket watch, made in the Netherlands by the French maker Blondel in about 1686, was recovered during underwater archaeological investigations led by Edwin Link in 1959. The watch was stopped with its hands pointing to 11:43; this matches well with contemporary accounts of the timing of the earthquake. Even before the destruction was complete, some of the survivors began looting, breaking into homes and warehouses. The dead were also robbed and stripped, and, in some cases, had fingers cut off to remove the rings that they wore. There were three separate shocks, each with increasing intensity, culminating in the main shock. The estimated size of the event was 7.5 on the moment magnitude scale. Despite reports of the town flowing into the sea, the main result of the earthquake was subsidence in the area of liquefaction. The probable triggering of the Judgement Cliff landslide during the earthquake occurred along the line of the Plantain Garden fault. Movement on this structure has been suggested as the cause of the earthquake. The Judgement Hill landslide is a complex rock-slide slump with a volume of about 80 × 106 m3. The slip surface is found within zones of clay and shale with gypsum at the base of a limestone unit. This landslide occurred shortly after the earthquake but it remains possible that heavy rain over the few days after the event was the final trigger for the slip. The sea was observed to retreat by about 300 yd (270 m) at Liganeau (probably near Kingston) while at Yallahs it withdrew 1 mi (1.6 km). It returned as a 6 ft (1.8 m) high wave that swept over the land. One possible cause of the tsunami is thought to be the slump and grain flow into the harbour from beneath the town itself, although the waves in the harbour may be better described as seiches and larger waves reported elsewhere, such as at Saint Ann's Bay, are explained as the result of an entirely separate submarine landslide, also triggered by the earthquake. Estimates of current deformation of Jamaica suggest that sufficient strain has accumulated to generate a M=7.0–7.3 earthquake, similar in size to the 1692 event. This may mean that a repeat of this event is imminent, although this estimate relies on many assumptions, such as that none of the motion on the Plantain Garden fault is accommodated aseismically. ^ a b McCann, W.R. (2004). "Estimating the threat of tsunamigenic earthquakes and earthquake induced-landslide tsunami in the Caribbean" (PDF). In Mercado-Irizarry A, & Liu P. Caribbean tsunami hazard: Proceedings of the NSF Caribbena Tsunami Workshop. World Scientific Publishing Co. pp. 43–65. Retrieved 19 December 2009. ^ a b Little B.J. (1991). Text-Aided Archaeology. CRC Press. p. 40. ISBN 9780849388538. ^ "The Link Collections" (PDF). Retrieved 2019-03-18. ^ a b c d e f g USGS (21 October 2009). "Historic Earthquakes: Jamaica 1692 June 07 UTC". Archived from the original on 17 December 2009. Retrieved 6 December 2009. ^ a b c d e DeMets, C.; Wiggins-Grandison W. (2007). "Deformation of Jamaica and motion of the Gonâve microplate from GPS and seismic data" (PDF). Geophysical Journal International. 168 (1): 362–378. Bibcode:2007GeoJI.168..362D. doi:10.1111/j.1365-246X.2006.03236.x. Retrieved 10 February 2018. ^ Mann, P.; Demets C. & Wiggins-Grandison M. (2007). "Toward a better understanding of the Late Neogene strike-slip restraining bend in Jamaica: geodetic, geological, and seismic constraints" (PDF). In Cunningham W.D. & Mann P. Restraining bends, transpressional deformation and basement controls on development. Geological Society, London, Special Publications. 290. Geological Society, London. pp. 239–253. Retrieved 19 December 2009. ^ a b c Gragg, L. (2000). "The Port Royal Earthquake". History Today. Retrieved 21 December 2009. ^ O'Loughlin, K. F.; Lander J. F. (2003). Caribbean Tsunamis: a 500-year history from 1498–1998. Advances in natural and technological hazards research. 20. Springer. p. 263. ISBN 978-1-4020-1717-9. Retrieved 21 December 2009. 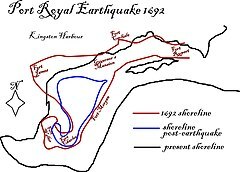 ^ a b "The Port Royal, Jamaica Earthquake and Tsunami of June 7, 1692" (PDF). TsuInfo Alert v. 3, No.4. 2001. Archived from the original (PDF) on 21 December 2009. Retrieved 22 December 2009. ^ Lyell, Charles (1837). "XXV" (PDF). Principles of Geology. 1. p. 447. Archived from the original (PDF) on 21 May 2009. Retrieved 22 December 2009. ^ Ahmad, R.; Scatena F. N. & Gupta A. (1993). "Morphology and sedimentation in Caribbean montane streams:examples from Jamaica and Puerto Rico" (PDF). Sedimentary Geology. 85 (1–4): 157–169. Bibcode:1993SedG...85..157A. doi:10.1016/0037-0738(93)90080-O. Retrieved 20 December 2009.